As the Obama administration continues what’s being described by critics as its war on whistleblowers, recently published documents have shed some light on the lengths the administration has gone to prevent leaks. Cited in a series of reports published by McClatchy newspapers, the Obama administration’s Insider Threat program has been detailed, including most recently in a piece titled “Experts: Obama’s plan to predict future leakers unproven, unlikely to work”. Now joining us is the report’s coauthor, Jonathan Landay. He’s a senior national security and intelligence correspondent for McClatchy newspapers. He has written about foreign affairs, U.S. defense intelligence, and foreign policy for more than 30 years. And he’s joining us now from Washington. Thank you so much for being with us, Jonathan. JONATHAN LANDAY, NATL. SECURITY CORRESPONDENT, MCCLATCHY NEWSPAPERS: My pleasure. NOOR: So, Jonathan, what can you tell us about this new program that’s just been revealed in your reports? LANDAY: It’s the Obama administration’s response to WikiLeaks and the leak of hundreds of thousands of pages of U.S. government documents by Army private Bradley Manning to WikiLeaks. It was decreed by the president more than two years ago but received very little [incompr.] It’s still being implemented. And one of the most noteworthy things about this program is that it’s taking the kind of practices that have long been used in the intelligence community and the Defense Department for monitoring leaks of classified information, but this time extending them to government agencies and departments that are not directly involved in national security but do have access to classified information. Those would be, for instance, the Department of Education, the Department of Agriculture, the Social Security Administration, the EPA, and the like. It is a effort that involves in part having federal employees monitor the behaviors of their coworkers. They are supposed to be trained in recognizing behaviors that apparently indicate that somebody is or could be a insider threat, someone who might not only leak classified information without authority but unclassified information without authority and commit other acts. One of the things that we wrote about, the focus of our latest piece is on the fact that there doesn’t appear to be any scientific basis for the idea that having people monitor their coworkers’ behaviors will give you any lead as to who in the future might be a leaker or some other kind of security risk. NOOR: Now, Jonathan, what kind of behaviors do these documents you’ve obtained require federal employees to monitor? LANDAY: Well, for the most part it leaves it up to–the White House leaves it up to individual agencies and departments to come up with their own list of behaviors. And for the most part, most of these agencies and departments have adopted classic counterintelligence indicators of suspicious behavior–a sudden accumulation of wealth, unexplained wealth, unexplained foreign travel, failure to document contact with foreigners, this kind of thing. But some of them have also added other indicators, for instance, someone who is going through a bad divorce, someone who drinks, has a drug problem, someone who supports, you know, the underdog causes, this kind of thing. NOOR: Now, as you noted, this program was put into place before Edward Snowden leaked the documents from the NSA. But Edward Snowden’s leaks have raised in the public’s consciousness the fact that many private contractors that are not directly employed by the federal government also have these top-secret clearances. Will these–does these policies also affect government contractors? LANDAY: Yes, they are applicable to government contractors in each of the agencies and departments that are involved in this to whom this directive applies. And that’s virtually all agencies and departments of the federal government must also ensure that their contractors, contractors with access to classified information, are also are trained to recognize and report these so-called suspicious behavior indicators. NOOR: Now, you’ve also spoken to a range of experts and whistleblowers themselves who have raised some serious concerns about this program. Can you talk about some of those concerns? LANDAY: Yeah. The concerns are, first of all, that you can’t use–there’s no science behind the idea that you can use indicators of suspicious behavior to predict that someone sometime in the future is going to become a security risk. That’s one of the problems. But another major problem is that the people untrained in counterintelligence and investigations will–because of the pressure they’re under to report this kind of behavior, will report all kinds of behaviors, and perhaps unnecessarily instigate investigations and recriminations against people who are not security risks but exhibit behaviors. You know, people who work in the federal government are human beings as well, and they have the same problems that other human beings have. And the fact that somebody is having a rough divorce or is not feeling well or is having mental problems, there is a great deal of concern that those could be taken as indicators of someone being a security risk and provoke unnecessary–as I said, unnecessary investigations and recriminations against these people. NOOR: Now, your articles also raise the specter that this program, the Insider Threat program, can be used to go after legitimate whistleblowers. Now, we just interviewed Thomas Drake, a man who was charged under the Espionage Act by the Obama administration, faced 35 years in prison, and then had all the charges dropped against him. Here’s a clip of what he had to say in response to this Insider Threat program that McClatchy newspapers revealed. THOMAS DRAKE, WHISTLEBLOWER AND FMR. NSA SENIOR EXEC. : This administration, I mean, it’s a war on truth-tellers and whistleblowers. 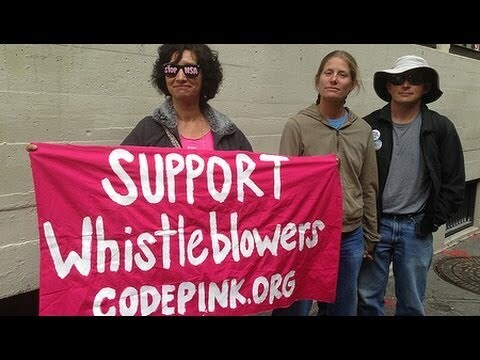 The whistleblowers are fair game. There’s no protection for whistleblowing. The Insider Threat, whistleblowers are regarded as one of the primary threats. And so the administration wants to make sure they’re snuffed out. I mean, it’s–what can I say? I mean, it’s extraordinary what–I mean, this administration has gone after more whistleblowers in terms of charging them and truth-tellers, charging them under the Espionage Act, the Espionage Act of all things, than all other administrations combined. I mean, it’s just an extraordinary development in our history. And clearly he, Obama and company, have no quarter for those who dare speak truth to or of power. And so they want to hammer him, hammer him good. I mean, I personally faced 35 years in prison. NOOR: So, Jonathan, what’s your response to what Thomas Drake had to say about the Insider Threat program? LANDAY: Well, we actually cited Thomas Drake in our first article on this. And the concerns that he expressed are concerns that other whistleblowers have expressed, and that is that this program will not discriminate between legitimate whistleblowers and will not help legitimate whistleblowers, and that will allow even greater possibility of unfair recrimination against people like Thomas Drake who try to use the internal mechanisms for reporting waste, fraud, and abuse, and instead of being listened to and having action taken on their reports suffer retaliation and retribution from their superiors. And there’s a great deal of concern that there’s going to be even more of that kind of thing happening with the advent of the Insider Threat program. NOOR: And finally, Jonathan, these documents obtained by McClatchy, it would appear that they were leaked to you. What does that tell you about government employees’ response to this program? LANDAY: Well, first of all, these documents are not classified documents. Second of all, we asked the administration, both the White House, the Office of the Director for National Intelligence, and other entities within the government for these documents. They refused to give them to us. Someone who–and obviously I’m not going to tell you who–leaked these documents to us. And it just goes to show that the government is not living up to what President Obama said would be the most–to his pledge to oversee the most transparent administration in the history of the United States, where you have the government refusing to even give us unclassified documents. NOOR: Jonathan Landay, thank you so much for joining us.